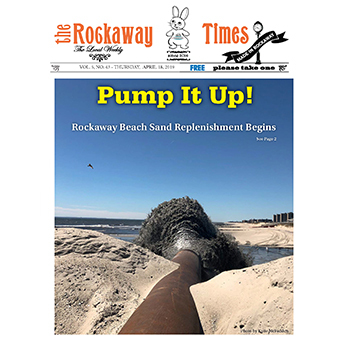 The U.S. Army Corps of Engineers (USACE) began its project to replenish the sand in the highly-eroded area of Beach 92nd to Beach 103rd Street this week, in hopes of finishing before the summer season gets underway. Guess what was poppin’ this past Sunday, April 14 at Whit’s? None other than a pizza-making class for children on the autism spectrum. Chef Whitney Aycock of Whit’s End, known for dishing up some of the best pizza on the planet, warmly hosted children and parents with Rockaway Beach Autism Families (RBAF) for their very own pizza-making class. The children got a hands-on experience making their own personal pizza, deliciously topped with marinara sauce, cheese, pepperoni and arugula. A volunteer firehouse wouldn’t be possible without volunteers and on April 27 and 28, the Broad Channel Volunteer Fire Department (BCVFD) is hoping to pique the interest of some new recruits. Despite gloomy weather, Rockaway Little League held its opening day celebration last Saturday, April 13 at Fort Tilden, commemorating its 65th year with food, rides, raffles, special guests, and baseball. Although rain the previous night had dampened the fields, it did not dampen the spirits of the little leaguers and their parents who attended the event to kick off the 2019 season.